With the glorious summer evenings long gone and the faint sound of Jingle bells just around the corner, we're all searching for that last drop of Vitamin C before the year is out - with ideas of being whisked off to a tropical island somewhere south. 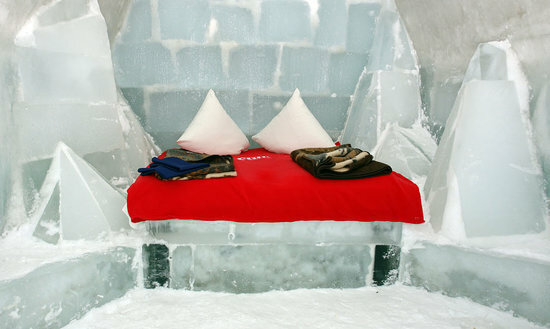 But if you're looking for something a little more quirky, then an Ice Hotel is the perfect destination. We've rounded up a list of the top 10 from around the world to get you feeling all festive and cosy. Staying in one of these incredible locations is on most people's bucket list, making them ideal for your next travel incentive or prize promotion. Immerse yourself in a dreamland of snow and ice, surrounded by mountains. With a tunnel system that connects the igloos, restaurants and bars to each other, attention to detail is key in this enchanting village. They have different size igloos available, from standard to love-nests and even suites with your very own private Jacuzzi. Iglu-Dorf also offers nightly snow walks, as well as a wooden stone sauna and hot tub in the snow. The original hotel made of ice, it's an exhibition for local architects and artists as it's reborn every winter with a new design. This means no year is the same, so a revisit is a must. It's all about creativity, imagination and an unforgettable experience. They also offer ‘warm' and ‘cold' rooms, so whilst you may book a couple of nights in a warm Arctic Chalet, you will also be able to experience a cold Art Suite in the same stay. Let's not forget about the ICEBAR where you can have a drink or two in your very own igloo. Since opening in 2001, Hôtel de Glace has attracted over a million people from around the world to witness this magnificent work of ice art. Like ICEHOTEL, it's rebuilt every year and is the only hotel of its kind in North America. A unique space just 4km from the north end of Québec City, it's a must-see attraction that offers a range of packages to suit your style. From Nordic Escapes with a hot tub under the stars to Adventure Experiences with a dog sledding shuttle service. This year sees the SnowVillage take on Game of Thrones, with rooms designed around the hit TV show. You can even find a life-sized Iron Throne and a Braavosi Hall of Faces. But you have to remember to watch out for the white walkers! Nearly 200km above the Arctic Circle, it's a magical world full of fun for all the family. Dine in the Ice restaurant from €66 per person, with the natural décor tastefully illuminated with colourful lights and candles. At the northernmost ice hotel in the world, explore the contrast of temperatures as you sleep nestled in cosy fur-lined sleeping bags in your private igloo. Sorrisniva started as a small six bedroom boutique hotel and has since grown with over twenty-six bedrooms, four decorated suites, an ice chapel and an ice bar. It was the first one of it's kind in Norway, with peaceful surroundings and incredible views of the Norwegian winter landscape. Austria's first snow village promises adventure and tranquility, as well as luxury accommodation in the Alps. Their all-inclusive packages mean you'll enjoy a fondue dinner, drinks, breakfast, accommodation and support from guides from just €199 per person, per night. The temperatures may be below freezing, but this cosy family-run hotel will warm your heart. They even offer Igloo construction workshops where you can get a taste of what it's like to build the magnificent structure every year. 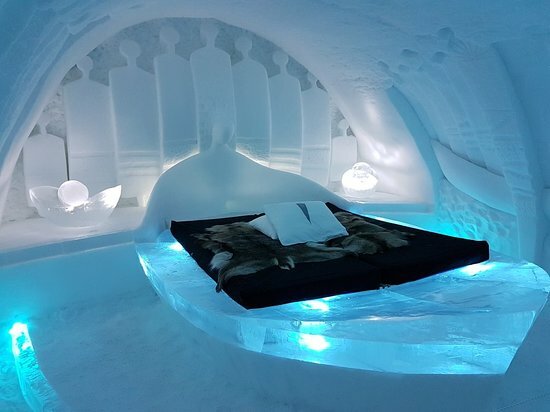 This resort is probably one of the more famous ice hotels, where visitors can choose between a variety of different accommodation depending on their budget and requirements. Choose to stay in the traditional glass igloo, where you can admire the northern lights in all their glory as you sleep under the stars. Kakslauttanen also offers a huge range of seasonal activities. In the winter you can try husky or reindeer safaris, snow tanks and even aurora hunting. Open from January-April each year, you have to be quick to experience this incredible castle structure. With the world's largest snow restaurant that seats around 200 guests, and an abundance of arctic adventures, this is the ideal location to relax and immerse yourself in the snow and ice. Located in Kemi near one of the few places in the world where the sea freezes, creating a unique playground for locals and visitors. They offer SnowCastle Glamping, Seaside Glass Villas and of course rooms in the SnowHotel. Built in a secret location only revealed prior to its opening, the Igloo Hotel in Slovenia is a boutique ice hotel with only two large igloos and two small igloos available for overnight stays. 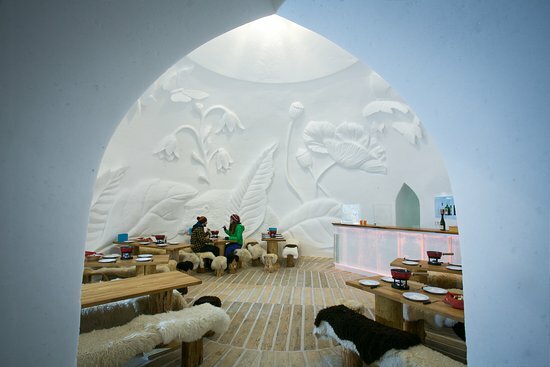 The nearby restaurant serves traditional Slovenian cuisine, and specially created Eskimo drinks to warm your insides. It's close to the slopes, so skiing is a definite must-do activity during your stay. They also hold Eskimo nights, where a guide takes you across the snow and gives a tour around the village. Situated on Balea Lake with its calm emerald waters, Hotel of Ice uses these huge blocks from the lake to construct the rooms, restaurant, bar and church they have in the village. The incredible scenery of snow-covered peaks and the glacial waters that surround this hotel will overwhelm you, making it one of the best destinations for a once-in-a-lifetime trip. They don't just offer Igloos, there's also a nearby Chalet with 14 double rooms. With prices from just €100 per night, it's an absolute steal. Active create prizes and provide prize fulfilment for promotions and incentive travel programmes. If you need prizes for a promotion or travel incentive please contact us.